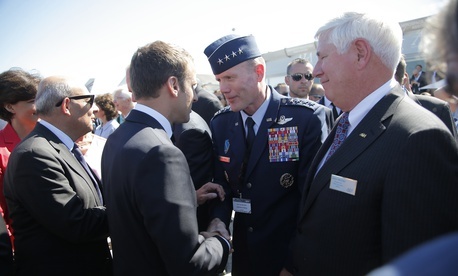 Wolters, who currently commands U.S. air forces in Europe and Africa and leads the region’s joint air command, will as NATO chief wear the customary second hat as leader of U.S. European Command, responsible for all American troops on the continent and in Israel. He is a combat pilot with a diverse resume including time in Washington at the Pentagon's Air Force and Joint Staff headquarters, and as a liaison to Congress. He has flown the F-15, F-22, and A-10 among other aircraft, and fought in Desert Storm, the Iraq War, and Afghanistan, where he also was deputy commander of political-military affairs. The White House originally had wanted Army Chief of Staff Gen. Mark Milley to take command of NATO, Defense One has learned from multiple sources. Last summer, with many senior leadership positions due to rotate, Milley was considered for the role but instead asked Trump for a more plum assignment: chairman of the Joint Chiefs of Staff. With Gen. Joseph Dunford's term due to expire this year, Milley's request was considered to be a bit of an ultimatum, according to a former U.S. official. If the chairman's job was not open for him, Milley preferred to retire. When it was clear he had a shot at the chairmanship, he pressed, and edged out the perceived front-runner, Air Force Chief of Staff Gen. David Goldfein. Trump announced Milley was his pick unexpectedly, and the search was back on for a NATO commander to replace outgoing Gen. Curtis Scaparrotti. Wolters takes the joystick at a tumultuous time for the alliance. While its military commanders express unwavering support NATO, the alliance and its members remain under constant berating from U.S. government leaders. President Donald Trump and cabinet members press European leaders to keep increasing defense spending and threaten to abandon the U.S. commitment to defend them. Last week, the White House was criticized for floating a “protection racket” proposal to force European allies to pay 150 percent of the costs of stationing American troops in their countries. In a Thursday hearing on the 2020 budget request, Acting Defense Secretary Patrick Shanahan assured members of the Senate Armed Services Committee the “cost-plus-50” plan would not happen. It was the latest in a series of examples where the Trump administration officials have tried to strong-arm NATO with public threats that challenge what foreign policy community leaders see as sacrosanct conventions of collective defense. On April 3 and 4, NATO officials and 29 foreign ministers are scheduled to mark the alliance’s 70th anniversary with a half-day meeting, reception, and special events in Washington, D.C. Watchers are on edge about whether the Trump administration and military officials will continue the good cop-bad cop routine. Stoltenberg said in a subsequent press conference the White House’s “cost-plus-50” idea had not reached Brussels. “There’s been no such proposals discussed in NATO, so this is only reports in the media.” He also said had accepted an invitation to give an address to a joint session of Congress. In January, Secretary of State Pompeo drew fire for suggesting that the Trump administration might not honor its mutual-defense responsibilities if Montenegro did not meet its pledge to spend 2 percent of its GDP on defense. Pompeo also called “silly” a House vote to deny Trump funds for withdrawing from NATO. “This administration has done more good for NATO than the previous several administrations combined,” Pompeo told Fox News. The announcement of Wolters’ selection as NATO commander came Friday morning as Trump paid a visit to the Pentagon for meetings on Syria with his national security team. NATO’s heads of state are scheduled for their next meeting in London in December.